Synthetic peptide (Human) derived from the region of human Pyk 2 that contains tyrosine 580. The sequence is conserved in human and rat. Purified from rabbit serum by epitope-specific chromatography. Any reactivity towards the non-tyrosine phosphorylated PYK 2 protein, the corresponding phosphotyrosine (577) of the Focal Adhesion Kinase protein, or generic phosphotyrosine has been eliminated through a series of preadsorption steps. Our Abpromise guarantee covers the use of ab4806 in the following tested applications. 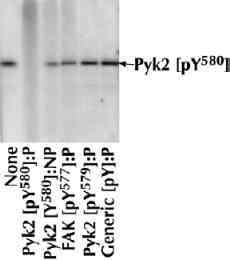 Extracts prepared from CEFs (1) or CEFs expressing PYK2 and plated on fibronectin (2-7) were resolved by SDS-PAGE on a 10% polyacrylamide gel and transferred to PVDF. Membranes were blocked with a 5% BSA-TBST buffer overnight at 4oC, then were incubated with PYK2 (phospho Y580) antibody for two hours at room temperature in a 1% BSA-TBST buffer, following prior incubation with: no peptide (1, 2), the non-phosphopeptide corresponding to the immunogen (3), the phosphopeptide corresponding to PYK2 (phospho Y579) (4), a phosphopeptide derived from the corresponding region of FAK (5), a generic phosphotyrosine-containing peptide (6) or, the phosphopeptide immunogen (7). After washing, membranes were incubated with goat F(ab’)2 anti-rabbit IgG HRP conjugate and bands were detected using the Pierce SuperSignal method. The data show that only the peptide corresponding to PYK2 (phospho Y580) completely blocks the antibody signal, thereby demonstrating the specificity of the antibody. ab4806 has not yet been referenced specifically in any publications. Publishing research using ab4806? Please let us know so that we can cite the reference in this datasheet. There are currently no Customer reviews or Questions for ab4806.